March is the month that I am always obsessed with the color green...it's only natural after all these months of hibernating. Winter is dragging on and things are gray and muddy and I am craving spring and all the color that will soon bloom. It can't come fast enough. But at the same time that I want spring to hurry up and get here, I stop for a moment and think holy crap, the month of March is halfway through already, where is this year going? Why can't time slow down? !...I swear this happens every year in March, right about now. You'd think at this point in life I'd be accustomed to it, but no. In order to deal with this 'seasonal, time is moving too fast, but not fast enough' distress I start cooking with lots of green foods, which isn't the worst thing in the world being that most green foods are healthy for you. I love the hue, it's so bright, airy and calming. My aunt gifted me a spiralizer for Christmas and a couple weeks ago she sent me a clipping of this recipe in the mail. I've never put these ingredients together before so reading the recipe I was really interested to see how they would all taste together. Well let me tell you, they're marvelous. So marvelous that we're taking this to dish to Pennsylvania to share with our family at Easter. It's perfect for this gap between winter and spring that they so call March. It's light but filling, easy to whip up and a beautiful shade of green to get you in the mood for the nice weather that's to come. 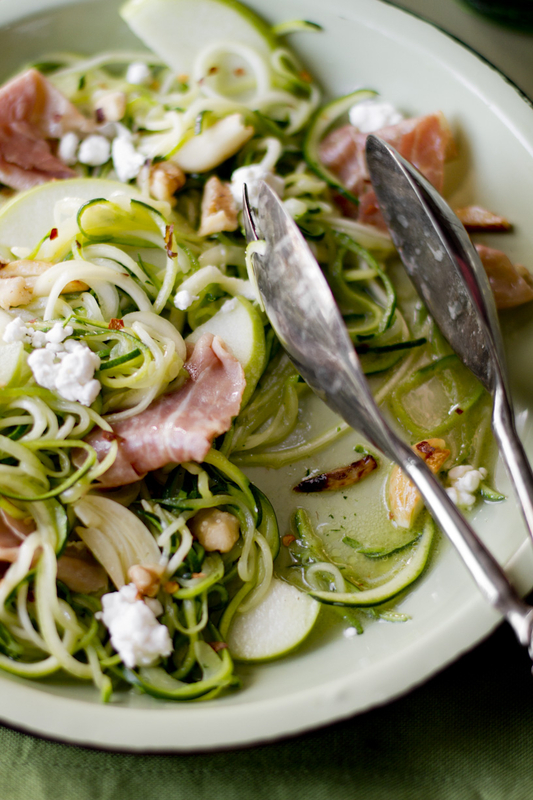 Using a spiral vegetable slicer, cut zucchini into long thin noodles. Cut noodles into smaller strands, if desired. In a very large skillet heat 2 Tablespoons of the oil over medium-high heat. Add garlic. Cook, stirring constantly, 2 minutes or until just starting to brown. Add zucchini; cook and toss with tongs for 1 minute. Transfer to a serving bowl. Add walnuts to skillet; cook and stir 1 to 2 minutes or until toasted. Add to bowl with zucchini. Add 1/2 teaspoon kosher salt and crushed red pepper; toss to coat. Add remaining oil to skillet. Add prosciutto. Cook 1 minute or until browned and crsip, turning once. Add to zucchini mixture along with apple; toss to combine. Top with goat cheese.